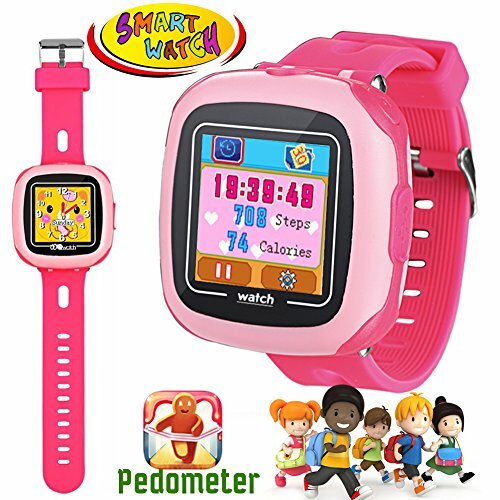 Kids smart watch design for Age 3 - 12 Boys,Girls,Students, Multi-function Sport Outdoor Education Learning Toys for Travel & Home. Come with a Adorable Nice Gift Box with Window Display, Suitable for Giving as Gift for Children. Parental Controls Function: parent can set up the game time to balance kids study and game. 1. Switch the ON/ OFF switch located in the right side of the watch to ON position. 3. When the clock is displayed on the screen, press the Home button to go to the Main menu. press the shutter button to take the photo.  Fitness Tracker Monitor & Camera Watch: Built-in 3G-axis sensor can accurately record kids steps, the pedometer can aslo do as a health monitor to record kids' exercise time, distance, energy consumption.1.5" Touchscreen watch with the funny camera which has various photo frame to record happy time with friends. Kids can edit graffiti on their pictures in the Gallery. ⏰ Multi-function: Alarm clock/ countdown/ stopwatch/ pedometer/calculator function, More than 20 clock display interface and ringtones to choose from, let the children establish the concept of time.Built-in microphone, the panda will distort your voice and repeat what you said and sang. And it will give you different actions.  Perfect Gift for Boys Girls: This 1.5" sensitive touchscreen smart watch is easy for kids to use, the Silicone Wristband is comfortable can be adjusted for wrists as the reference. Do not worry fall off! Intimate design, convenient and durable.  Warranty Service GUARANTEE: Design with Splash-proof and sweat-proof but cannot be dipped in water and used for bathing. We guarantee 3 months warranty to Symfury' smartwatch, Please be free to buy.